Our labradors love swimming in the dam and jumping / fishing in the creeks.They are very social when it comes to visitors, they assume that anyone that comes are there to see them. There life is one big adventure from the time they awake in the morning wanting to play ball-right to the end of the day when they come pounding towards you for there last cuddle before bed. They all just roam around at there leisure. They have their beds in the stable which has a doggy door - but they much prefer my chair on the verandah or find a grassy spot under a tree for a snooze. 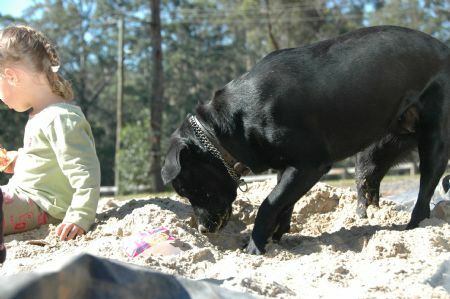 There is always one in the sand pit digging a hole with the kids or laying there having a snozze waiting for them to return. All our labradors are very much a part of our family life, they are very much loved and spoilt by all of us.They are always looking after the kids and letting us know when one of them is in trouble! We love it when we have puppies arrive and the mums love us helping to look after there babies....... but .........the saddest part is saying goodbye to the babies, so we endeavor to find loving homes that promise to love them as much as we do!! !